These were the immortal words reiterated by Gary Linekar in the early hours of Saturday morning after the spectacular Opening Ceremony of the London 2012 Summer Olympic Games. Being in London, we have the opportunity to see the transformation of one of the greatest and most diverse cities in the world. From our windows here in Bethnal Green, not only can we see the sunshine (yes!) but also a new wealth of people flocking through our streets seeing what we have to offer. Every four years records are smashed, hearts are broken and the world is given a new perspective about the ability of the human body. Whether that be running, swimming or cycling faster than anyone ever has or simply being at the pinnacle of your discipline. The Olympics gives us a sober reflection of what we can achieve if we put our minds to it and have the drive to succeed. Independent of the sport, we can see innovation and recreation in architecture, engineering and other places where we might not usually expect. A good example of this is the Olympic cauldron that is burning in the Olympic Park as we type this. For those of you that are lucky to be in London or surrounding areas to enjoy the cultural, social and physical attractions that are happening for the next month will be open to a whole new world of ideas. The Houses of National Olympic Committees are fantastic to go and see and be inspired by. They represent the nations of the world and what they have to offer. The opportunity to see the Czech Republic or Brazil down your road is not something that will return and so we think it is a good idea to just experience a different way of living and share it with your friends. The Games have begun, and they will last 16 days. If you blink, you might miss it. But the legacy and symbol of these Games goes further than those two weeks and a bit. The slogan for the Olympics in 2012 is “Inspire A Generation” and we are the “Ideas Generation” so why don’t we create the legacy when we pass the torch on to the next generation? Arrive there nice and early – getting through the queues and the security is a bit difficult. The army are quite stringent there, so make sure you don’t bring a cold drink because they will throw it in the bin. For men, do not wear loose trousers with a belt because you will be asked to take them off (the belt that is!) and for everyone, wear loose-ish trainers as you might have to remove those as well and you don’t want to hold people up. Eat well before you go – the food there is pretty expensive with not the greatest portion sizes so I would fill up on stuff before you get in. And you will just end of eating McDonalds – oh the irony! Bring an empty water bottle – rather than paying £2.30 for a bottle of Coke, you can fill up at free water fountains and save yourself some money and probably save your teeth as well. Although you might have to wait in a queue so get one person to do multiple bottles. Travel light – the chances are that the weather is going to be hot and so lugging around a rucksack is not going to be ideal. You are only permitted to carry a medium size bag anyway so take that into account. Expect queues/delays – this is probably the most important point. There are going to be lots of people, you are a small fish in an extremely busy, international pond and so don’t do the British thing and complain. Grit your teeth, enjoy the sunshine and bear it because the greatest show on earth only comes around for two weeks in our lifetime. Take A Walk –the best thing to do is to just explore and look through all the nook and crannies of the park. See if you can find the trail of crayons in the Thames and the meadows of flowers and long grass – really is worth a look! Talk to Volunteers – some of them have absolutely amazing stories and information to tell you so do not be afraid to go up and ask them a few questions. They are trained to be polite and smile, so they should hopefully be able to point you in the right direction and give you some good service. It is not just about Sport – it would be a good idea to download the “Join In” official app on your smart phone and have a look at what is going on elsewhere in London. They have spent millions on making London the best city in the world and so why not enjoy it? Most of it is free anyway, and most of us like a bargain. Public Transport – make sure that you plan your route before you leave the house, because as soon as you have set foot out of it, you could be stuck and waste a ticket. The Get Ahead Of The Games posters that we have been seeing is a really useful tool to get up to date info and also plan your way in any way out to save you some time and some of your sanity. Capture it! – for goodness sake, do not forget to take as many pictures and videos as possible and find the weirdest and wackiest things that you can. You can send the best ones on to me and I can post them with your name on this blog and people can have a look at what you have been up to. That is all from me for now. Hope those of you that are lucky enough to be here will enjoy the games and everyone else on the telly. The greatest show on earth is less than 24 hours away…will you be watching? For those of you that are impatient like me, this is the sort of post that you might like to read. For those of you that want to “#savethesurprise” (the official hastag Twitter thingy) then I would suggest that you go back to Facebook or actually read a real book. As soon as you walk up to your seat in the stadium, you are hit by how real and up close you are to what is going on. Whether that be the “fake” clouds that are roaming past you and, I kid you not, the farmyard animals that are roaming on the grass in the middle of the stadium – the papers were not lying. 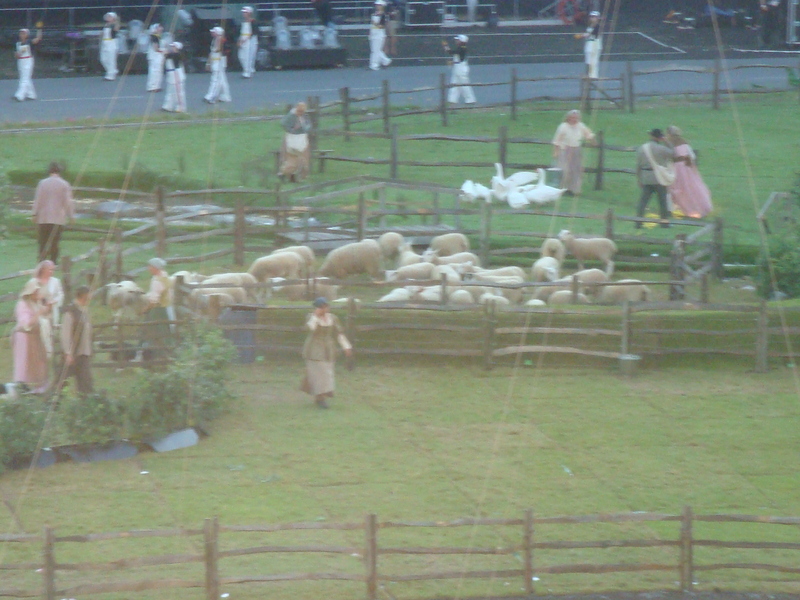 It was a bit weird at first, but with some of the actors playing traditional roles in the countryside, it was mystical. But the only thing I kept thinking was how the hell are they going to move all of this stuff to make way for everything else? But they did. It was everything that London isn’t – efficient, on time, minimum fuss or confusion and finished. 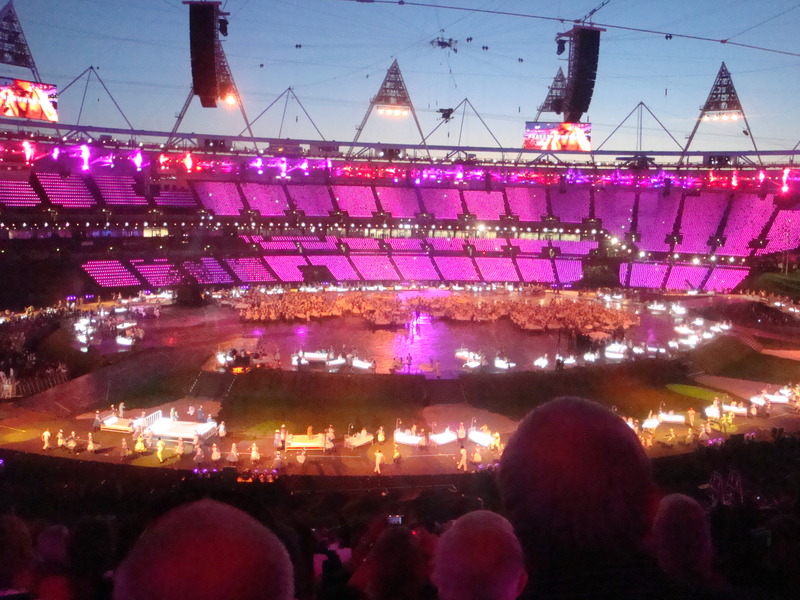 We are lucky that Danny Boyle is Scottish, aren’t we? All joking aside, even through writing this post, I feel bad for divulging too many details – as he said himself “This show is for the performers, it is for the people and so I ask you to keep it a secret for them.” I was still tweeting pictures during the rehearsal, but still fair do’s. What are they cooking up in the cauldron? The only thing that I can do is to give you some clues about what the show might entail. The Beijing Ceremony for me was a great spectacle of discipline, aggression and fierce beauty, but I felt as if they were showing off a bit. It really lacked the character and the sheer British humour that Boyle captures in this show. He takes everything from film, music and history that is uniquely British and turns it into a real West End style show. It evoked an emotional response from everyone in the crowd, a sense of pride that has been lost in the last few years – you could tell that people were getting goose bumps watching the show, even though it was only a rehearsal. The Stadium in All its Glory! I have to say it really is the best show that I have ever seen live, I am not sure how it will come out on television. For those of you lucky enough to have tickets (spare ones are welcome at my house if anyone is feeling generous) then you will not forget what happens on Friday for a long time. It is something that you will be able to tell you kids or your grandkids, or someone else’s kids if they are lucky. 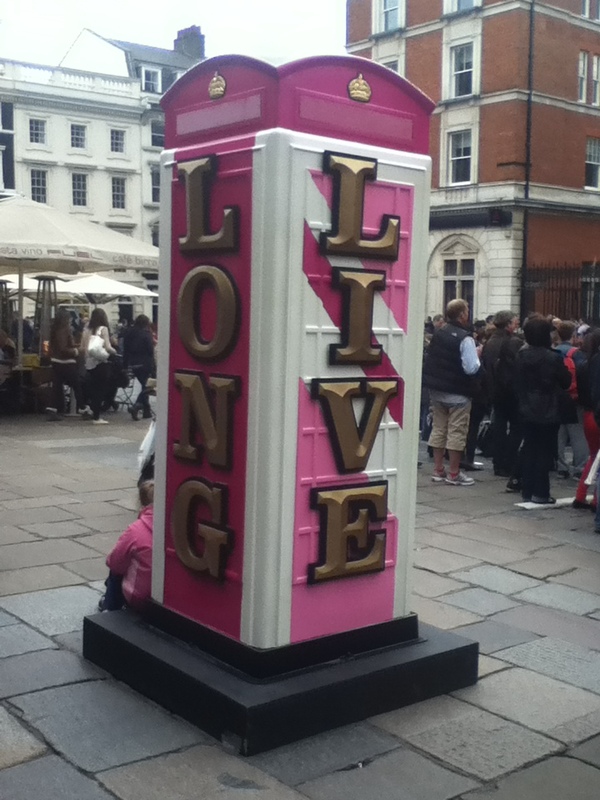 I was fortunate enough to be in London for the Diamond Jubilee weekend when everything was happening and so one can give a review on the weekend. Sorry, I couldn’t resist. To be honest, the rarity of the four day weekend is a close kept secret amongst London-folk where they dream of not having to sweat, whatever the weather outside, on the Tube and being able to sit at home on a Sunday without having the stormy cloud of the Monday Blues hanging over their head. I could see from my social networking feed how many people were excited by the happenings of the weekend in front on them on the previous Friday. People were already camping out and buying their bunting. Sainsbury’s sold the most barbeque food it has ever sold on that Saturday for the following day in its history, so the stage was set. And then God did the British thing. And kept doing it until now. It is doing it whilst I type. Let me give you a couple of clues – it is wet, rhymes with pain and is as recognizable in Britain as the Queen…worked it out yet? Rain. Proper, start-building-an-ark rain which literally washed out basically every street party in the country, apart from the ones in Scotland. So the one weekend where Scotland isn’t miserable and wet, England was and all of those people who had asked for permission to close their streets, sat under their gazebos as their neighbours dare not venture out, as the cakes started to go stale. What a perfect start. Luckily for us we were able to avoid it sufficiently in order to get to the banks of the River Thames at Blackfriars in order to observe the flotilla, which in English is a boat parade of a thousand boats on the famous local river. OK I know it sounds like watching paint dry. At least that is what could be said of the BBC coverage. 2,500 complaints was it and the Director General said he was”proud”…hmmmm. Well the pleasant thing was that watching it live was not so bad. And plus Londoners were actually talking to each other on the train and in the street….and they were not arguing…it was definitely a sight for sore eyes. It is true that atmosphere cannot be underestimated, watching thousands of people wave flags was quite a sight. So to take us to the Monday and it seemed that people were still recovering from the night before. Nevertheless we got to the city to meet a few friends and it seemed as if it was business as usual. The weather did not hold out as much as I would have liked, but I got a few good snaps of some of the relics from the weekend in Covent Garden. Visiting Chinatown in general is an experience, but a street party there is a whole new experience – I will never forget how dragon candy is made, the orient’s best kept secret. Wrapped it up with a trip through Soho to get to the car. It seemed that some of them started early that day and anyone who has been to London knows what Soho is known for, so I need not say anymore. If you don’t, then Google it – it will probably explain it better than me. Finally, even though I was pretty much numb from the waist down from the standing and walking, I trudged on to Tuesday. 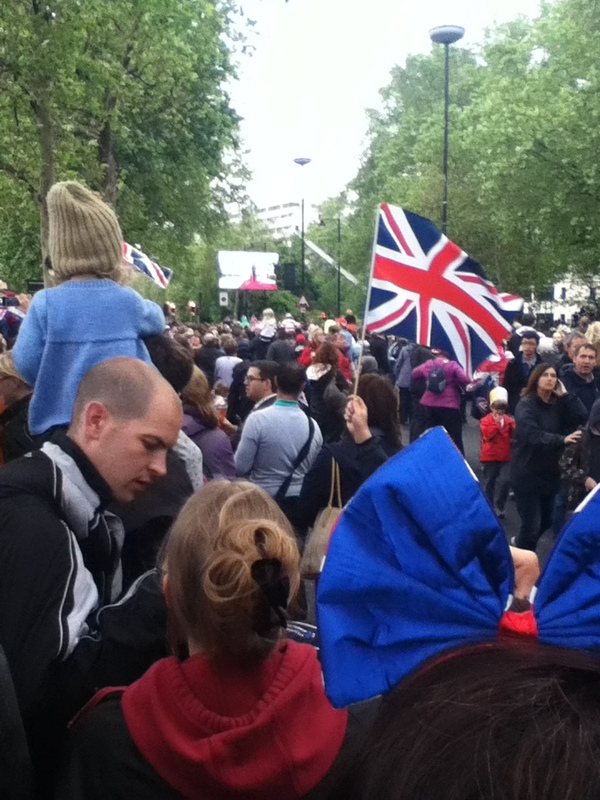 With a few friends, I got to see the Queen passing us in the street, and that was the nicest part of the day. We were hit with road closures, blockages and just general nuisances which meant that we got lost in the National Portrait Gallery (don’t ask…) and ruined our plan of going to Trafalgar Square. So we walked to St. James Park. Closed. Then Regents Park. Closed. Finally Green Park. Op-Closed. So we walked to Hyde Park which was an hour away in the rain and plonked ourselves in front of the big screen surrounded by free crisps and other goodies that were rejects from the Jubilee Festival – I can tell you we were not complaining. It was cool to see the Red Arrows live, but then again the rain seemed to dampen our spirits. Overall I can say that the Diamond Jubilee is an event that will probably never come around again, and I really hope it doesn’t, I don’t think my legs nor my umbrella could take it. I guess it is one of the steps on the road to A Summer To Remember, and trust me, it isn’t something that I am going to forget for a while. So chin chin, as one must retire. Hope you have a lovely Jubilee (Del boy accent)! The Greatest In The World. Not Half. I am in a good mood today, because I am done with the bulk of my exams and so I am feeling relieved and looking to relax. Then I realised I haven’t blogged in a while and so I thought I would get my pen out (metaphorically speaking) and talk about something that I thought was interesting. The thing that has been bombarding me recently is…wait. I am not going to tell you what it is yet – I want you to guess. 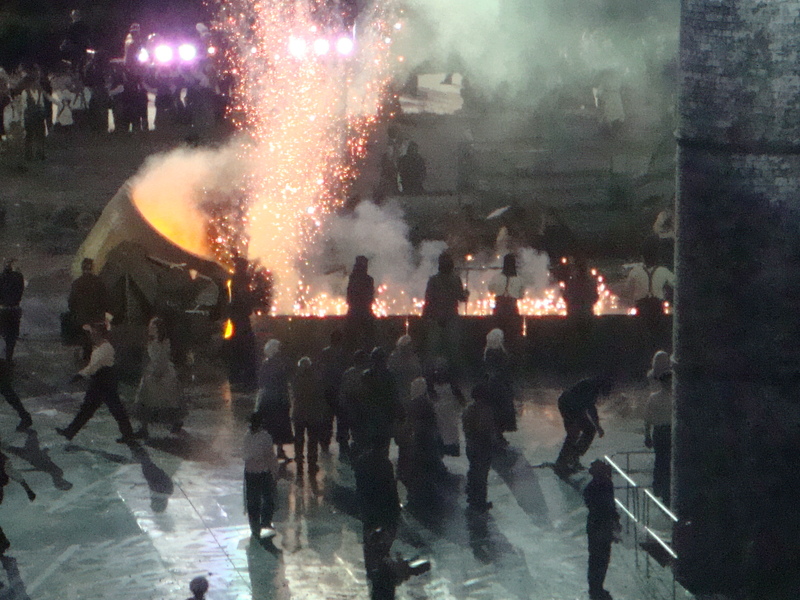 It involves fire, a lot of exercise and thousands and thousands of people. No it is not a rubbish pub joke, I am talking about the torch relay. The sign that the Olympics is a matter of days away. There is only a small amount of time before the eyes of the world will be on London. The thing is, I don’t think people have been excited about the Olympics. Sitting on the Tube in the last few months, I have been listening constantly to people just finding any excuse to say how horrible the Games are and how poorly planned they will be. No wonder people are so miserable. You just need to spread a little bit of positivity – London is going to be the greatest city in the world for 6 weeks and we are going to be in the middle of it. That is pretty special. Thousands of people are flocking to our city and all we can think about is how many people are going to clutter up the transport system. I can’t believe I am saying this, but grow up, wake up and feel it. It will be gone in the blink of an eye and you will regret not experiencing the greatest show on Earth. Sure I am disappointed not to be flying the flag, or more appropriately carrying the torch (no hard feelings Seb Coe) but I can appreciate that past all of the drama and the problems, this is a once in a lifetime opportunity, so even if I am sitting in a park, or watching my TV, for once we need to be proud of our city and proud of ourselves. The greatest city on Earth. Not half.